Nesco is a company that sells roaster ovens, dehydrators and other kitchen appliances. My brother recently was accepted into optometry school (!!) and will be moving out on his own for the first time this coming fall. I emailed Nesco to see if I could review one of their roaster ovens for him since he needs a full kitchen worth of equipment. I was sent the 6 quart red roaster which retails for $50. It can serve up to 6 people which will be great for him for making food for the week or if he has people over. 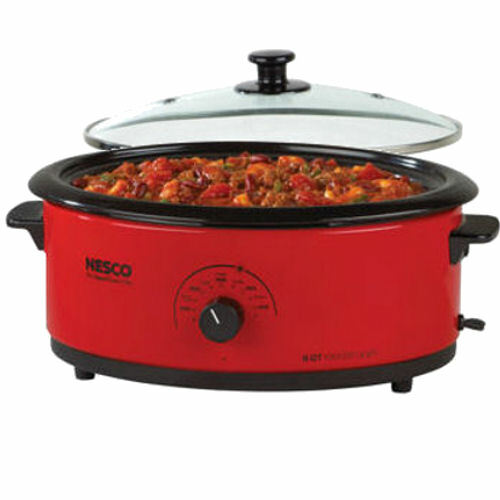 The new NESCO® 6 Quart Roaster offers the same features of a classic Nesco® Roaster Oven with Cool-touch handles. It's a convenient size for entertaining and small families. Great for making a batch of chili, soup, and stews. Just the right size for a pot roast, lasagna, 2 cornish game hens or a whole chicken. Perfect for potlucks, tailgating, RV's and camping. These are sold at Meijer and other similar stores. I think that this roaster looks great! I love the bright red color of it and know that my brother will love it. He loves to cook chicken so I'm sure that he will be making lots of chicken in here. I personally love my roaster that I have for making a roast, shredded vension, shredded pork and more. The giveaway will be for one 6 quart Nesco Roaster ($50 value). I like cooking spare ribs in the crock pot. I like to cook stew in the crock pot. I like to cook beef stew. I love cooking pot roast! Left my comment on the form as you requested. :) Lori D.
My favorite is Beef Stew with Dumplings in the crockpot! Warms your bones when the chilly weather moves in! I love cooking pulled pork! White Chili and pork roast. Love the smell in the house! bbq chicken and salsa chicken,so easy and so good. I like to cook turkey chili! The Nesco roaster is a great tool that everyone should have in their kitchen. It is amazingly versatile. I've used a Nesco roaster for years...on my 3rd one now. I love cooking potato soup! I love baking meatballs and putting them in the pot to soak in my sauce all day! Pot roast is my fave! I like to cook vegan white bean chili.